FC Halifax Town again recovered from a losing position to draw 1-1 with bottom-club Kidderminster at The Shay. Town were slow out of the blocks again and were deservedly 1-0 behind at half-time thanks to Gurjit Singh heading the visitors ahead. But Halifax were much improved in the second-half, they could hardly have been poorer, and got a share of the spoils their response merited through the superb CJ Hamilton. The hosts again left themselves with work to do after falling behind; a pattern that must change if they’re to start climbing the table. Neil Aspin said before the game that Town look like scoring at one end but conceding at the other, and both rang true here. But the main frustration remains that Town only tend to start playing when they’re behind in a game; thankfully, again, they found a response. Tim Flowers only took over at Aggborough the day before the game, with manager Gary Whild moving upstairs. And the omens weren’t great when the visitors arrived at The Shay at 2.05pm after getting stuck in traffic on the M6. It didn’t take long for the former England international to start gesticulating on the touchline like a veteran, but he’ll have been encouraged by left-winger Tahvon Campbell’s start to the game as he ran at Kevin Roberts time and again. It was no surprise he had the first shot of the game, which was comfortably saved by Matt Glennon, who inherited the captain’s arm-band from Hamza Becnherif, who moved into midfield to accommodate the returning Matty Brown. It was also little surprise that Kidderminster opened the scoring as, for the ninth time this season, Town conceded first. The quality of the goal could not be disputed as Singh rose majestically, albeit unmarked, to meet Aman Verma’s excellent cross and loop the ball over Glennon. If anything, that inspired the visitors even more as they belied their status as the bottom side in the league. 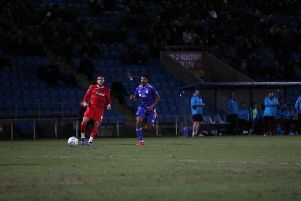 Verma was only denied a goal himself 10 minutes later when his tap-in was ruled out after a push by Kelvin Langmead in the build-up from a Kidderminster corner. If this was a chance for Town to kick start their season, Kidderminster clearly agreed and started in more confident mood than their hosts, thanks in no small part to the outstanding Campbell. The problem of conceding first was apparent as the visitors happily placed men behind the ball and asked Town to break them down, which the hosts went about with mixed results. David Brooks displayed all the enthusiasm and fearlessness of youth with some impromptu skill and darting runs, but elsewhere it was too pedestrian, with some players seemingly inhibited by a lack of confidence, perhaps understandably so given Halifax’s start to the season. Town got into some promising positions, but failed to take advantage, such as when a loose pass let in Jordan Burrow for a charge forward, but his pass to the overlapping CJ Hamilton was slightly too strong, and the chance fizzled out. Similarly, a sublime piece of skill from Brooks set-up a possible chance, but Burrow’s pass into Danny Hattersley ran out for a goal kick. Again, it seemed to be the younger players rising to the challenge in blue, with Brooks and Hamilton impressing; the latter’s excellent cross should have been headed in by Bencherif from six yards instead of being nodded over the bar. Just before the break, Brooks created something out of nothing with some fine close control and a neat pass to Burrow, who shot narrowly over from the edge of the box. Again Neil Aspin responded at half-time with a double substitution as Josh Macdonald and Jake Hibbs replaced the injured Hattersley and Bencherif, whose withdrawal was met rather harshly a few ironic cheers from some home supporters. Town’s tails were up at the restart, with Hamilton bringing a save from Alex Palmer and the hosts showing a generally more aggressive and pro-active approach. The Town youngsters continued to show the way as Brooks sent Hamilton away down the left with a superb pass before the winger picked out Macdonald at the far post, who was only denied by the sprawling Palmer in the Harriers goal. But the backdrop to a much improved performance from Town since the interval was a series of awful decisions by referee Michael Salisbury, who twice awarded Kidderminster a goal-kick when the evidence pointed to a Halifax corner. The official also waved away two good shouts for penalties after Burrow and Macdonald both appeared to be pushed inside the box, with Macdonald especially seeming to have a strong claim; Neil Aspin could barely contain his anger on the touchline, nor could the Town fans, who cried ‘you don’t know what you’re doing’ in response. But Town found the equaliser their second-half deserved when the lively Macdonald slipped in Hamilton, who produced an excellent first touch before calmly working half-a-yard of space and slotting past Palmer. It was now getting stretched as Halifax pressed for a winner, while Kidderminster offered sporadic threats on the break. Hamilton was proving to be a huge threat since being shifted up-front alongside Burrow, and with Macdonald adding some trickery on the right, the hosts looked much more incisive going forward. There was an energy and purpose about The Shaymen as the second-half wore on that was sadly lacking before the break, but Kidderminster refused to buckle, with centre-half Kelvin Langmead providing some inspiring defending, matched at the other end by James Bolton, who repeatedly stepped out of defence with the ball to join in the Town pressure. Hamilton continued to bear the burden of Town’s attacking threat on his young shoulders, with a fine run from the right flank ending in a shot just over the bar. A similar run down the right culminated in a low cross which Burrow sent just wide of the far post. At the other end, Bolton produced a goal-saving block from Jared Hodgkiss’ shot before Macdonald headed the ball off the line from the resulting corner as the game ended in an end-to-end contest to rival Murray v Djokovic at Centre Court. Halifax: Glennon, K Roberts, Bolton, Brown, Bencherif (Hibbs 46), McManus, James, Brooks (Hughes 79), Hattersley (Macdonald 46), Hamilton, Burrow. Subs not used: Porter, Banton. Kidderminster: Palmer, Hodgkiss, Langmead, Clarke, Rowe-Turner, Singh (Jones 83), Verma, Fox, Campbell (Wright 50), Dinsley, Styche (Green 76). Subs not used: Snedker, Spencer.